Hot damn, what a season! What a season, what a season, what a season! Doesn’t February feel like ages ago? Or a minute ago? This weekend is the last time we’ll see many on the touring scene together for a while. And boy, is it a doozy. The Disc Golf Pro Tour Championship starts Thursday at New World Disc Golf in Jacksonville, Florida. This tournament is as much a unique test of mental fortitude and focus as it is a physical challenge for a variety of reasons. The event seeds players based on their season-long performance at DGPT events, only the top DGPT point earners in each division are able to compete, and the top players in each division are rewarded for their consistent excellence all season with a bye to the quarter or even semifinals. The eventual Open Division winner will play as many as four rounds of golf, or as few as two. The 2018 Open Women’s division winner will play as many as three rounds or as few as two. This arrangement makes for the possibility of a Cinderella story, for one of the lower seeded players to make a run for the title a la Dana Vicich in 2017 who made it to the final card from the bottom of the bracket. It’s not your typical disc golf tournament, but it’s certainly exciting. Take a look at each division bracket to see how the DGPT Championship will go down. The big difference is the matchplay-style format, as scores reset after each day. Think back to June and July when many top touring pros decided to spend a chunk of time in Europe ahead of, and immediately following, the Konopiste Open. Think back to the Utah Open, Great Lakes Open, and Idlewild. Players who *cough* Paul McBeth and Catrina Allen *cough* decided to limit their time in Europe and play the DGPT events which others decided to pass on, earned extra DGPT tour points and are now being rewarded with having to play half the golf than those who skipped a few events. Now, we wouldn’t begrudge players for taking advantage of the opportunity to take their talents to Estonia or Finland, but with $7,500 going to the MPO winner and $2,500 to the eventual FPO winner, maybe some of those players are rethinking their plans for next season. 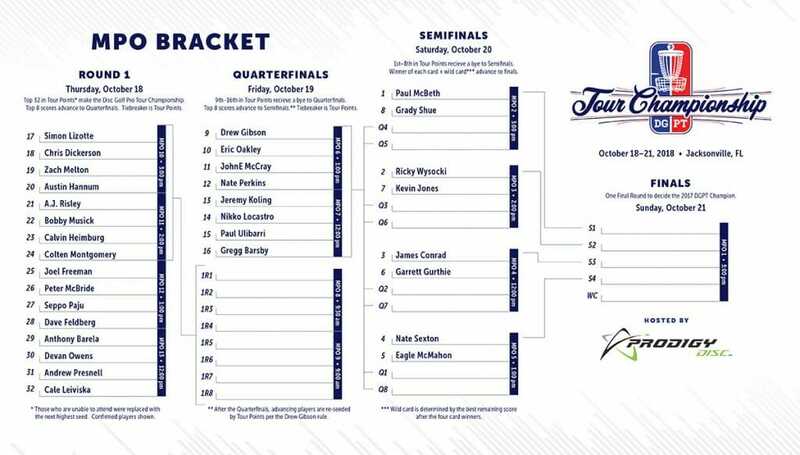 The way this tournament is organized means that by the time someone like, say, Simon Lizotte, gets to the finals he will have played three rounds at a long course, while someone like, say, James Conrad will only have played one round. One could argue that the player in Lizotte’s position has the advantage of being warmed up and familiar with the course, but at the end of a long grueling season, I suspect that every bit of rest will be an edge. The FPO will play only three rounds over the weekend and will have a day off on Saturday between their semifinal and final rounds. Due to the smaller field, only four players: Paige Pierce, Sarah Hokom, Jessica Weese, and Catrina Allen will get byes to the semifinals. World Champion Paige Bjerkaas did not earn a bye. 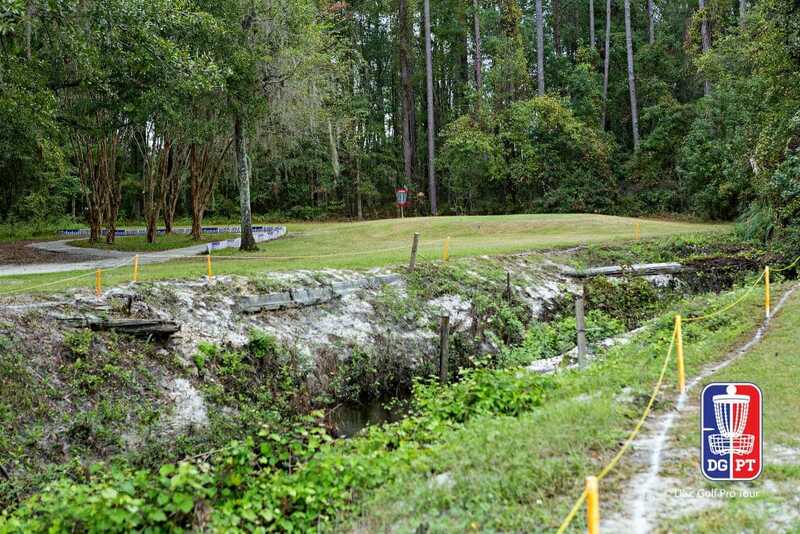 The opening rounds of the DGPT Championship will give us an opportunity to watch and follow players who maybe get overlooked or overshadowed by the bigger names on tour, and to recognize their skills. 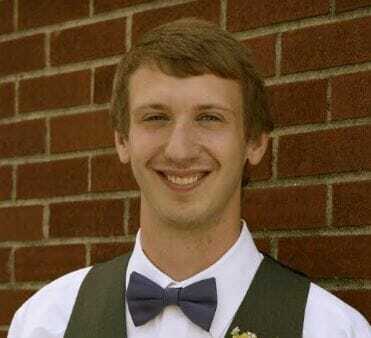 On the MPO side, we’ll get to see players like Peter McBride and Devan Owens do their thing. 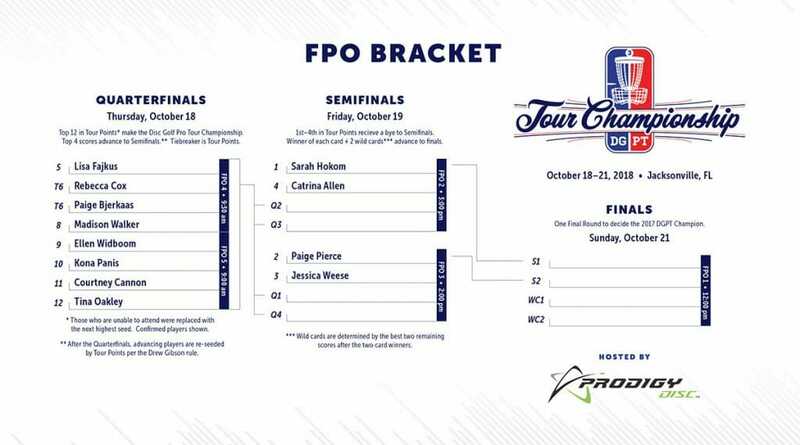 For FPO we’ll be looking forward to Tina Oakley and Ellen Widboom jockeying for a position in the semifinals. Last season, Ricky Wysocki came into the Tour Championship as the number one Open seed, and took home the championship. McBeth will try to repeat that feat, as well as continue his late season hot streak and take home his fourth win in a row to sweep the post-Worlds event docket. McBeth won the DGPT Tour Championship as the fifth seed in 2016. Hokom bears the top spot for the FPO side and has not won the event before. She was also the number one seed heading into the 2016 Championship, the year Allen took home the trophy. Pierce is the defending champion. New World Disc Golf “USA Links” Elite Course – (Thursday through Sunday): 18 Holes, Par 66, Long Tees: 10,643 feet. Short Tees: 9,102 feet. – This is a private, disc golf-specific venue on a defunct ball golf course. The championship layout, which has been dubbed the “USA Links” course, was co-designed by Will Schusterick and Phil Arthur and features plenty of palm trees, water hazards, and out-of-bounds areas. Major changes to the course for 2018 are on hole 7, where both the tee pad and basket have been pushed back. Right afterward, hole 8 has been shortened. Preview the caddy book here. 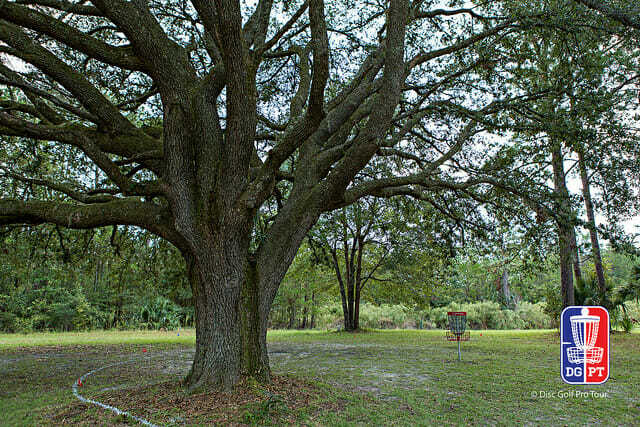 After a string of tournaments with pretty nice weather, it looks like rain and wind will move back into the forecast for the Disc Golf Pro Tour Championship in Jacksonville, Florida. 9 AM: 72° with a Northeast wind around 10 mph. Isolated showers possible. 3 PM: 82° with a Northeast wind around 15 mph possible. Isolated showers and storms possible. 9 AM: 70° with a Northeast wind between 5 and 10 mph. Isolated showers possible. 3 PM: 82° with an East-Northeast wind around 10 mph. Isolated showers possible. Noon: 84° with a Southwest wind around 10 mph. Isolated showers and storms possible. 3 PM: 87° with a Southwest wind around 10 mph. Scattered showers and storms possible. Noon: 73° with a Northeast wind around 10 mph. 3 PM: 75° with a Northeast wind around 10 mph. The main weather story this weekend will be the gusty wind and rain chances. A cold front will stall in the vicinity of northeast Florida, leading to chances of showers and storms each day of the tournament until Sunday. As of now, it looks like Saturday has the best potential for rain and storms. However, nicer conditions should follow for Championship Sunday. All video coverage for the event will be featured on the Disc Golf Pro Tour YouTube channel. Live coverage begins each day at 12 pm and will air through 6 pm, showing two cards per day. 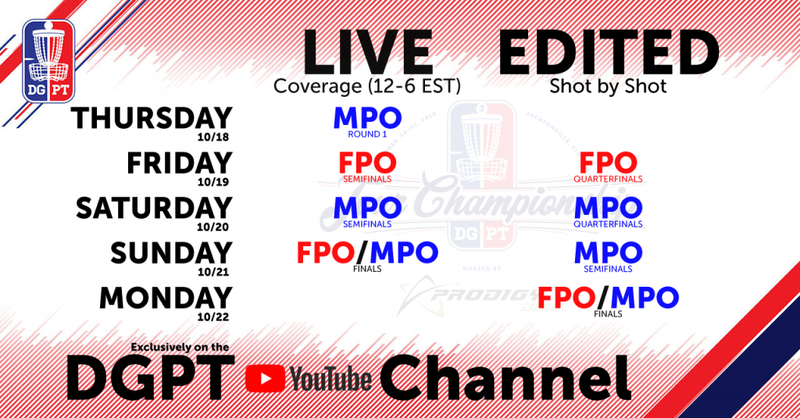 Thursday starts with the entirety of the MPO card, Friday features FPO semifinals, Saturday is MPO semifinals, and Sunday culminates with FPO finals followed by MPO finals. Post-produced footage of cards not covered will follow next day. UDisc Live will handle live scoring, and you can check-in here at Ultiworld for daily coverage of all the happenings. 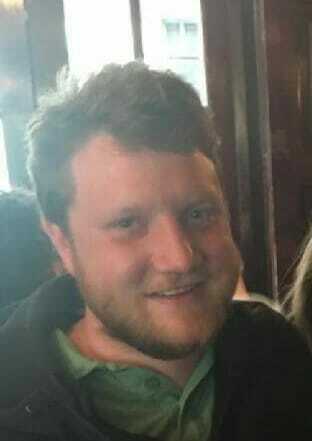 Comments on "DGPT Championship Preview: Bracket Madness Hits Florida"